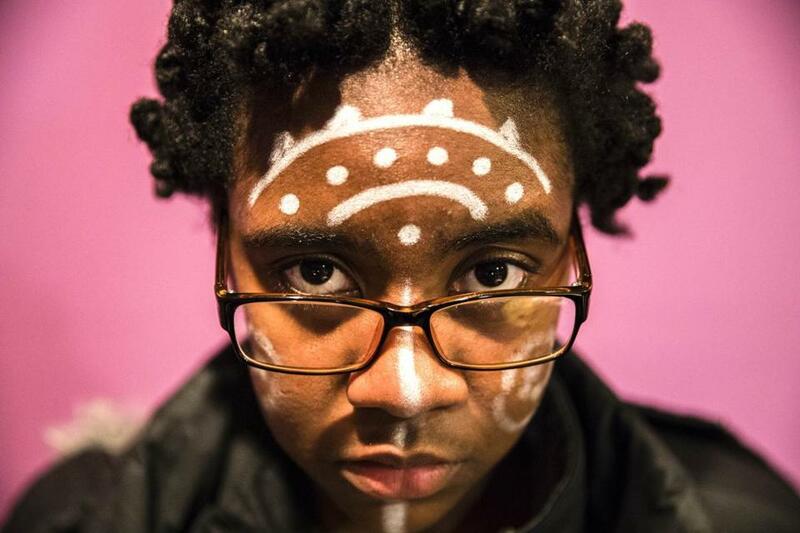 A student from Boston Arts Academy wore face paint similar to characters from the Black Panther comic book series during a discussion of the significance of the upcoming release of the live action "Black Panther" film at the city school in Boston. Celebrating blackness is, oh now, so bodacious. After a year of racial controversies — including systemic discrimination exposed in a Globe Spotlight series, slurs hurled in the Fenway Park stands, and a police tweet honoring a white Celtics coach during Black History Month — this week’s release of a Hollywood movie with black superheroes battling the forces of evil has aroused a sense of pride throughout this region. The excitement greeting Marvel’s “Black Panther” movie is surging from Boston to Springfield, where legions of fans are wowed by its focus on black people from a highly advanced black country taking charge of its destiny. People are buying out movie theaters for private screenings. They are raising thousands of dollars so that children — some with faces painted like the characters — can see it for free. They are putting black-owned businesses in the limelight or holding discussions on the movie. Black Twitter has been afire with Afrofuturistic fashion, costumes, and arguments about the future of blacks in America. There is no longer any doubt: “Black Panther” is a cultural moment. The action fantasy stars a hero of color leading a strong nation of color, and it reenergizes the superhero genre for viewers hungry to dream in their own skin. “Culturally speaking, we haven’t had an actual superhero coming from an African country that is revered in Marvel’s universe,’’ explained Darryl E. Moss, the founder of Springfield’s Association of Black Business and Professionals, which is scrambling to find a bigger venue to accommodate 175 people for a private screening Friday. 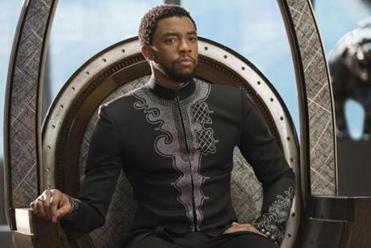 Hailed as a “masterpiece” by Rolling Stone, the movie follows the story of T’Challa, who returns to his fictional homeland of Wakanda, an African nation that is the most technologically advanced in the world, after the death of its king — his father. T’Challa isn’t just a ruler: He’s also a superhero who will be tested by formidable enemies and dangers, and he must rally his allies, including an army of female warriors. He must release the full power of Black Panther to defeat his foes and secure the safety of his people and their way of life. The movie features some of Hollywood’s biggest and rising stars, such as Chadwick Boseman in the lead role, with Michael B. Jordan, Lupita Nyong’o, and Angela Bassett. 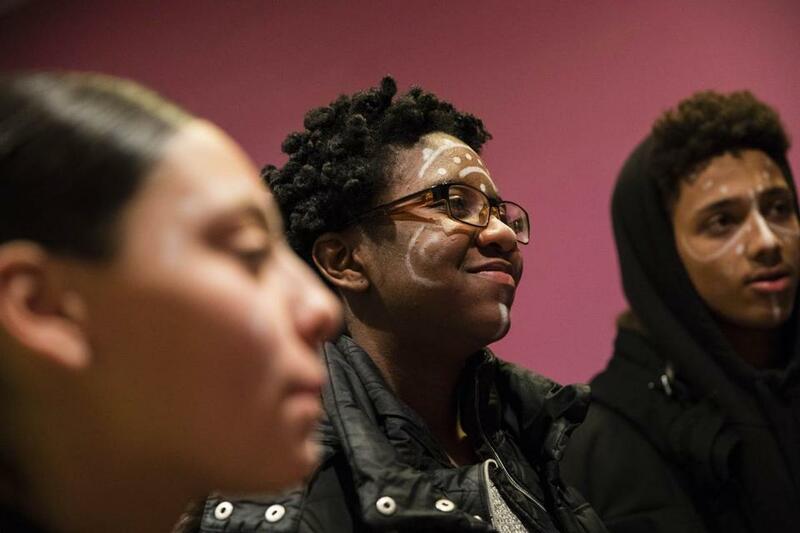 Nia Ramos (left), 16, Dainika Balan, 17, and Jayden Pontes, 17, wore face paint similar to characters from the Black Panther comic book series during a discussion of the significance of "Black Panther." And while there have been other black superheroes in Hollywood (think Wesley Snipes in 1998’s “Blade,” or Robert Townsend in 1993’s “The Meteor Man”), not since the 1990s has the black community been this revved up for a marquee flick — or any movie, for that matter, with a mostly black cast. When Hollywood trotted out “Love Jones,” “The Best Man,” and “The Wood,” moviegoing was a spectacular social event for blacks. Groups of girlfriends, young couples, members of church clubs attended movies as a theater-going experience with dinner, cocktails, and socializing. But those movies disappeared, as did black superheroes in leading roles. Now there is a hunger again for such movies — and the community experiences, said Sheena Collier, whose company, The Collier Connection, is helping to organize a private screening of “Black Panther” Friday at Regal Fenway Stadium. They sold 500 tickets within 24 hours, said Collier, who also works on racial equity in the private sector for the Boston Chamber of Commerce. Guests will be treated to a red carpet, and a photographer will snap their pictures. All are encouraged to dress regally in Afrocentric attire. After the movie, guests will head to GameOn sports bar for “Black Out Experience” — a friendly takeover, she said. In Roxbury, patrons are encouraged to sample the “Black Panther Experience” on Thursday that will feature live performances, black comic book artists, and a host of black vendors selling Wakanda gear. Grace Beah danced while waiting to watch a screening of "Black Panther" at AMC Loews Boston Common. The superhero factor is a big draw, residents said. Elizabeth Miranda, executive director of the Hawthorne Youth and Community Center, said she thought the movie would be a great opportunity for young people. 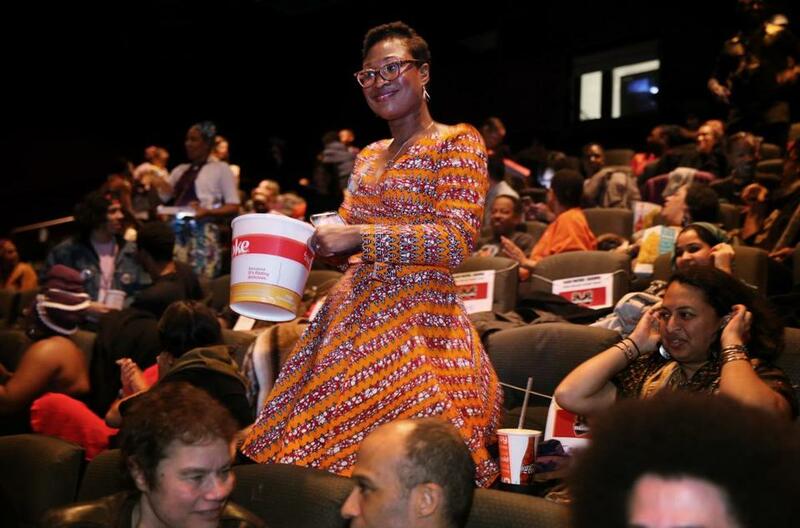 So she sent out an SOS of sorts, calling on Roxbury residents to help send 1,000 youths and 100 elders to see the movie for free during the February school break. She said she set up a GoFundMe page, and in just 12 days, the center raised $17,000 online and another $5,000 from Tufts Health Plan and the Boston Foundation. 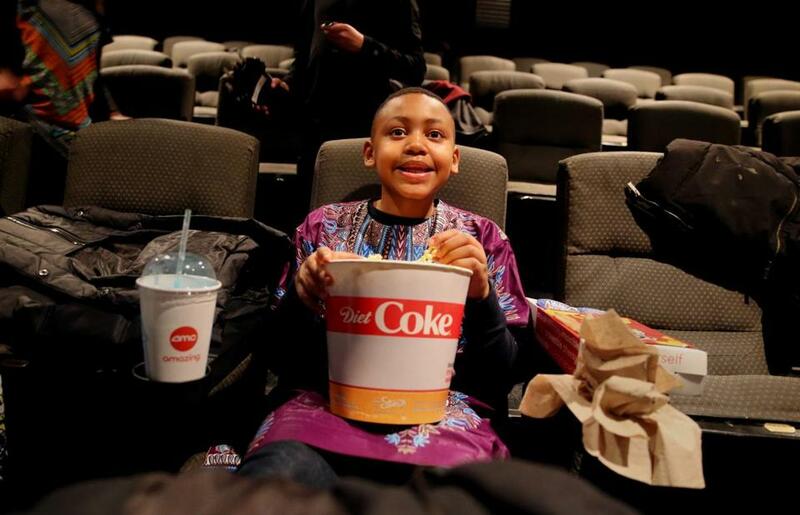 Fans watched a screening of a new animated version of “Black Panther” in Dorchester on Wednesday night. 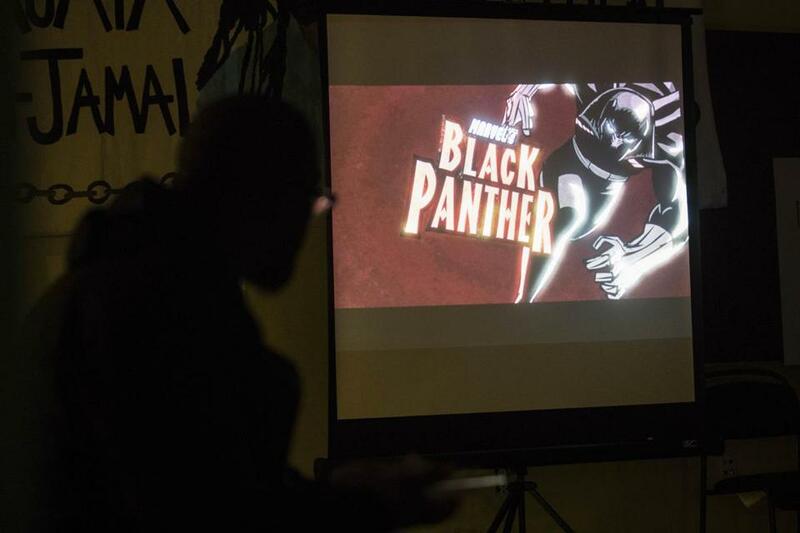 In anticipation of the big day, Khalida Smalls, another organizer, and members of Boston Anime Friday Crew began their party early by hosting a screening of a new animated version of “Black Panther” in Dorchester on Wednesday night. Christopher Taylor, 9, said he was the first to be seated for a screening of "Black Panther." Claudia Wilson, 37, said she appreciated how the premiere was organized in a way in which blacks could feel comfortable as a group in public. “Black people don’t have a lot of spaces in Boston to just be together without being profiled, or some other thing going on, so I feel like it’s nice to have a space and not be accosted,” Wilson said. Mina Remy, 38, said the film exceeded her expectations. Smalls said there are serious reasons for why she planned the Wednesday event, noting what she calls a surge of “anti-blackness” views. 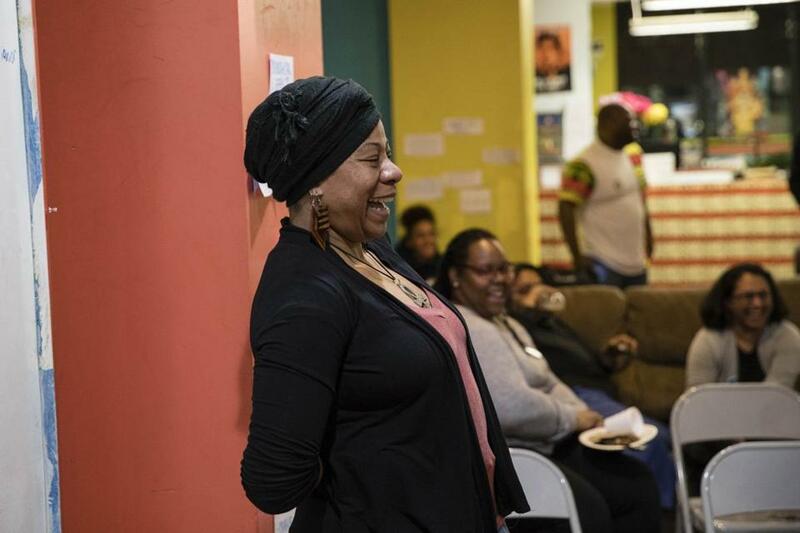 Khalida Smalls led a discussion of the significance of the upcoming release of "Black Panther" in Dorchester on Wednesday night.